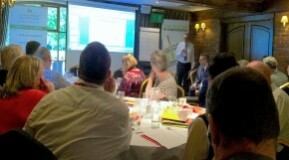 Taming the Adolescent Business – our best event so far! Probably our best event so far! Alexander’s Business Club had a near full house at their last meeting and the feedback has never been better. The speaker for the evening was our own David Alexander who covered a problem that is familiar to a lot of business owners. How do you deal with an Adolescent Business? Rather than go into too much detail David focussed on four simple actions that he uses and can help owners move their business in the right direction. The Three Year Plan – something that takes a holistic view of the owner and the business, and is as much about strategy as it is about finances. Two different styles of how the plan can be built were introduced together with a range of suggested categories that could be useful. These included subjects like Turnover, Products & Services, Marketing Plans and Remuneration. If you would like to build your own Three Year Plan this is something Alexander Accountancy can help with. Getting The Right People – covered working out who the business needs by building an Organisational Chart. Focussing on people’s character and nature to make sure they are a good match for the business, technical ability can be taught a lot easier than character can be changed. Making sure they are given the right training, a clear direction, understand where they fit in the business and what their individual future development will be as part of the business. If this is something you feel you need help with Alexander Accountancy can recommend a number of trusted advisors that can help. The Paygrade House – identified a number of roles that can exist in a business. It looked at how business owners can identify the roles they are doing and judge if they should be doing those roles as part of their time management. It also covered the options available to deal with roles the owner should not be doing. If you would like to try this exercise Alexander Accountancy can guide you through it or recommend a trusted advisor to help. Prioritise Almost Anything – by using a simple principle that has been around a very long time. This is time management for the business owner in its purest form based on two simple questions. Is it important that the business owner does this in person? Is it urgent for the business owner to personally fulfil this action? This principle also covered the aspect that whilst some tasks can be both important and urgent, they can also be delegated or outsourced. Once again if you would like to learn more about this principle it is something Alexander Accountancy can help with or we can recommend a number of trusted advisors that would be able to help. Alexander Accountancy, Else Solicitors, Midweb Services and Worldpay. Alexanders Business Club events are free to attend by invitation. If you have already attended an event you will receive an invitation by email, though we do recommend confirming your place with the relevant sponsor as soon as you can. Alternatively you can email us direct via info@alexander-accountancy.co.uk and we will place you on the sponsor’s guest list.